Aptly called a sound artist, Robert Henke spans the divide between musician and technician. A preeminent figure in modern electronic music, Robert and his collaborative music project Monolake have had an immeasurable influence on the sound of Berlin techno. As one of the founders of Ableton, Robert is no stranger to creating new tools for electronic music production and performance. Creating the ultimate customized granular synthesizer has been a labor of love for Robert for more than a decade. Enter the Granulator: a granular synthesis-based sample playback instrument. Granular synthesis is a technique that involves dividing a sample into very short pieces, and then playing the pieces back superimposed and crossfaded with one another. These pieces, or "grains," are usually under 50 milliseconds long and sound like short clicks when heard individually. But when layered together, grains can produce lush textures with rich modulation possibilities. To use the Granulator, drag a sample onto its waveform display. You can then adjust the length of the grains and the density of their overlap with the Grain control. The playback position within the soundfile is set with the FilePos knob and can be modulated randomly or via the built-in LFO. In addition to controls that influence the playback of the grains, there are also a number of "classical" synthesis parameters such as an ADSR envelope, two multimode filters and an FM oscillator that can dramatically alter the overall timbre. Granulator comes with a companion device called GranulatorInput that enables live input functionality for the Granulator. 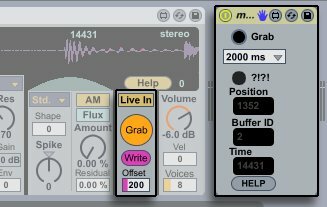 When the GranulatorInput device is on a track, any audio on that track can be captured in real-time by pressing Granulator's Grab button. The captured audio is then loaded into the Granulator automatically. To learn more and listen to sound samples, visit Robert's Granulator web page. Check out Ableton's in-depth interview with Robert Henke.